Roma boss Eusebio Di Francesco. 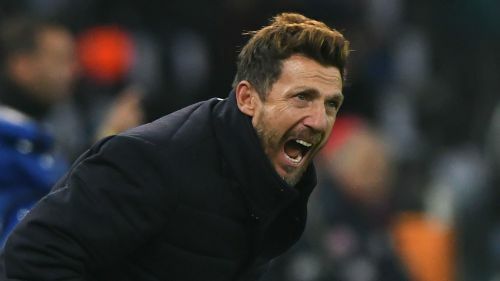 Eusebio Di Francesco says he did not get the response he was looking for from his Roma players as they were beaten 2-1 by Viktoria Plzen in the Champions League. Roma were already assured of their place in the last 16 but headed to the Czech Republic without a win in four matches in all competitions. And despite equalising through Cengiz Under after Jan Kovarik had opened the scoring, Tomas Chory clinched the three points for the home side, who progressed to the Europa League as a result. "These games help us to reflect and I did not get the response I wanted," Di Francesco told Sky Sport Italia. "To play for Roma we all must produce more, starting from the coach. They were able to get the better of us too often. "We started well, controlling the ball, but then allowed them to cause us big problems and we cannot afford that, even if for Viktoria Plzen it was the last-chance saloon. "I don't know if it's a general period of difficulty, but it's true to say we didn't defend collectively. "The biggest fault is to concede too much and not defend consistently. It allowed Plzen to get the better of us and that should not happen. "We expect a different performance from everyone, I wouldn't talk about individuals. "I cared more about the performance than the result today. We have to look forward and everyone must show more, put themselves up to the challenge." Roma host Genoa in Serie A on Sunday, hoping to improve on their position of eighth in the league table.